With three days of bass booming reveals, flashy upcoming game trailers, and people getting up close and personal with hands on demos of the new next gen consoles, it’s no doubt that this year’s Electronic Entertainment Expo was marked as the biggest and best in years. E3 2013 was mainly all about the console super giants Microsoft and Sony, and their upcoming game releases for the new Xbox One and PS4 consoles. Xbox had a lot to make up for after certain details came clear regarding backwards compatibility and their new Game Licensing Policy. But after a few audio hiccups during their presentation, they managed to wow their fans with some new insights and an awesome look at some upcoming releases for the Xbox One. On May 21st, Microsoft announced their new console and their new idea of an all-encompassing tool to centralize your gaming and home entertainment into “One” place. We’ve seen another big name try to achieve this idea (*cough-apple), but it seems Xbox has a better plan to make it happen. The first thing every critic did was jump on the band wagon about how bulky and ugly the new Xbox One looks. Unlike the previous Xbox’s, the Xbox One has a squarer and more boxy appearance, not something you would first expect from what is supposed to be the next generation of gaming console. But Xbox was actually pretty smart in their design. The new look gets behind their “One” idea by creating the new console to be sleek and conforming to match our preexisting home entertainment systems. The new Xbox One quite resembles the satellite or cable boxes that we already have sitting under our televisions. This concept will allow the Xbox One to become the centerpiece of our living room ecosystem while elegantly blending in and bringing everything together into one focused location. While the front of the box is simplistic in design having only a slot for the Blu-Ray disc and a humble Xbox logo, the back of the device is where the action happens. There are 2 USB 3.0 ports, a dedicated Ethernet and Kinect port, a HDMI out, and an HDMI in. The HDMI input will allow you to connect your Cable/Satellite receiver directly to the Xbox One and access your TV listings straight from your Xbox interface. Just say “Xbox TV” and start watching your favorite show instantly, or peruse your channel listings from your provider. Pretty doggone nifty! We also know that the new Xbox One will have dual-band 802.11n WiFi with a 5 GHz option for optimal speed. It will run an 8-Core AMD Jaguar x86 CPU and an AMD 7000-series Radeon GPU. There will be a 500 GB hard drive, 8GB of DDR3 RAM, 3 GB of which will be used to handle the three operating systems installed; One to run games, one to run entertainment (including communication and background tasks) and the last to allow you to switch between those programs instantly. Xbox One and some of its new games will incorporate the use of Smartglass interactivity more readily into its functions. Smartglass is already being used in association with TV and Movie apps adding additional viewing content and other interactive features that you can passively use to enhance your entertainment viewing pleasure. It is already a more practical tool out of game as a way to stay connected. The new features that are coming will allow you to check game achievements, leader boards, Xbox Live Tasks, messaging, and much more. But its the upcoming in-game options that will allow you to interact with certain parts of the game while you play that have the greatest potential. One demo at E3 showed a player using Smartglass to call in air strike on a target, while another brief demo showed a player entering a Smart Match queue for a multiplayer game while still playing the campaign portion. Its real usefulness during game play has yet to be seen, but we will undoubtedly see game developers exploit this option more in the future releases. Xbox One will also have an in console gameplay DVR that will allow you to instantly upload your gameplay to Xbox One’ Upload Studio. The Upload Studio uses Twitch, that is built into the Xbox One, in order to instantly broadcast and share your gameplay to friends. Kind of like a braggers YouTube. Now you can show off those amazingly glitchy kill shots that aren’t supposed to happen. Trendy is another new feature that is designed to collect real-time data of what you and your friends enjoy through your Xbox, be it what you’re watching like video on demand, music, sports, or games, it will propose recommendations for you based on that information. It will become “aware” of what you like and customize selections for you. Now not only will it be aware of when I’m in the room, but its going to be aware of what I like. It’s a little creepy. Skynet became “aware”, and look how that turned out. 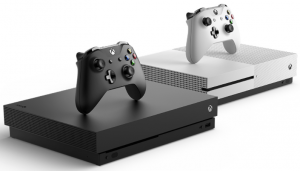 – After a one-time system set-up with a new Xbox One, you can play any disc based game without ever connecting online again. There is no 24 hour connection requirement and you can take your Xbox One anywhere you want to play your games, just like on Xbox 360. – There will be no limitations to using and sharing games, it will work just as it does today on Xbox 360. While its good that Microsoft listened to the demands of the people, it comes with a couple of losses to features. Due to these changes, gone is the ability to have your game library (downloaded online or uploaded from disc) digitally stored in the cloud so you can access it from any Xbox One. With no virtual licensing option you will now have to have the disc in the tray to verify ownership of the game, just as you do now. Also because of this, the previously announced “Family Sharing” of your Xbox Live Gold account is no longer available. The Xbox One will still allow you to purchase and download games online, however, they can not be traded, shared, or resold, and are restricted to that console only. I was actually excited at the idea of a downloadable and completely digitized games base. It’s one that’s already a reality with mobile devices and other PC based gaming companies like Steam. Flexible pricing has made Steam very popular among PC gamers. The fact that a game can be sold cheaper without all the excess packaging, shipping, and store mark ups, cuts out the middle man. It has given them the ability to make a catalog of games more readily available to their customers being both cheaper and more convenient. Moving to a digitized base in the future would allow developers to recoup the same cost and sell the game for a little less. Not to mention the resale value of games is pretty bad already, once a game isn’t new anymore, it isn’t really worth much. With that in the air, there is still a place for a digital online game base. It’s coming in the future whether we’re ready or not. Xbox might have made the jump a little early, but now that they know what they shouldn’t do, maybe they’ll develop a way to make it more acceptable in the future. Lessons learned. Xbox One’s price will be $499 and will be available in November. This price is a bill more than the PS4 but, one good thing for Xbox is that every Xbox One will come with a Kinect. PS4’s comparable add-on the Eye will be sold separately. This is actually good news for Xbox, while every new Xbox One will have motion sensing and voice recognition capability as a standard, game developers may be more inclined to incorporate those features into their games for Xbox consoles than they will for a customer base who may or may not have opted to pay for the additional feature. That being said, Amazon has reported that pre-orders for Xbox One are up 20% from the release of the Xbox 360. Looks like a lot of people are already willing to spend the extra for their next gen console. Xbox unveiled a number of games that will be available to Xbox One, some at release in November and others in the first year. There is no shortage of jaw dropping, the next generation of gaming is here. *The following lists and availability are subject to change by developers. Blue Castle’s sequel will follow Nick Ramos, as he struggles to escape the quarantined city of Los Perdidos before he’s cooked by a nuke flambé in what will be a more open world game play. Far Cry and Crysis’ developer Crytek set you on a quest as the role of Centurion leading his army as he annihilates his enemies in the name of Rome. The graphics of this hack and slash were as pristine as any blood and gore movie out there and possibly the best seen at E3. The most wanted game of Rare’s back catalogue has been recreated as an Xbox One Exclusive. The hands on demo said that it brought back the combo-crazy hail of button mashing combos like the original, with a definite improvement in graphics. That’s right, Minecraft is coming to Xbox. The pixelated game will now be in a high-resolution world with bigger maps and billions of more hours to waste, MC fans even have something to look forward to in November. Another CoD for the masses. Ghosts uses modern militia in U.S. scenarios without calling it Modern Warfare. With the balance of power turned and the U.S. no longer a superpower. Your band of elite soldiers wages a covert war against and unseen enemy. It’s CoD, you shoot things a lot. Enough Said. Bringing more destruction back to the multiplayer maps, developers have worked to create a better reactive environment as a big part of the multiplayer maps. There will be more vehicles and the ability to direct your squad in campaign mode. B4 was the game that demoed the use of Smartglass as a way to call in an airstrike on a target. This will be the first of DICE’s first person shooters to use their new Frostbite 3 engine. Creator Hideo Kojima said that this one will be more like a TV show and less like a film. The “episodes” will be a non-linear mission that will eventually come together in the end. This time they are using a more open world environment, so there will be less cut scenes that take away game play control. Besides the amazingly refined and beautiful graphics, the only real big news for this racing game is the Drivatar. As you play the game learns how you drive and uploads that info to the Cloud creating a “fake-you driver” that other people can race possibly earning you points while you’re offline. So when you race against fake drivers, you’re actually racing the figment of a real-fake driver. Make sense? Good. Ubisoft does it again, except in this prequel you’re a pirate named Edward Kenway, Grandfather of Conner from ACIV. Sailing around the Caribbean in your pirate ship as you brutalize other ships in a more open world game. As is always with AC games, I’m sure the story line will be one of the best parts. Cleverly sneaked into Microsoft’s Xbox One Presentation at E3, Halo 5 as we will call it, will be the first Halo to run at 60 fps, have dedicated servers for faster and fairer online play, and have cloud-gaming features. That’s pretty much all we know, other than it had a cool trailer and will be available sometime in 2014. With 343 Industries there is no telling what it will be like. Bungie’s first big push since dumping its bestselling franchise looks to be graphically breathtaking. So far they have said the game will have 4 playable races, in depth customizations in clothing, armor, and weapons, and a new unique multiplayer game. So far the game play is heavy on MMO style play. With characters seen as warlocks and hunters, different levels of gear that affect abilities, and an open world game. Destiny will also take heavy advantage of Smartglass, giving you access to your characters to change gear, abilities, and stats. It’s still a bit of a mystery and a pretty good gamble for Bungie. But, so far it’s looking good. The first official effort from Respawn Entertainment. Formed out of the Infinity Ward debacle this game has been in the shadows, secretly and covertly developing under the watchful and eager eye of Vince Zampella and his partner Jason West. Prototyped in Valve’s Source Engine, it wasn’t until the concept of Cloud computing was realized that the game began to evolve. This mixture Mech vs. Pilot vs. Mech game brings a whole new action to multiplayer first person shooters. Look for this to be a Titan for the multiplayer world in 2014.